The SteelSeries QS1 feels like a Cherry MX Red...on a diet. If you’ve followed gaming keyboards for the last two years or so, you know that the rise of RGB LEDs has also been the decline of Cherry MX. Once a mainstay of the market, Cherry MX switches have given way to a bunch of knockoffs and proprietary switches from companies like Logitech and Razer. Only Corsair has stayed faithful to Cherry all this time. But I thought if anyone else were to stick by Cherry, it would be SteelSeries. Not so. I’ve finally gotten around to trying the RGB-enabled Apex M800 and it’s my first taste of yet another proprietary keyboard switch, the SteelSeries QS1 (built in partnership with Cherry competitor Kailh). Let’s dig in. My first impression of the Apex M800 was, “Wow, this thing is huge.” Everything about it is massive, from the elongated plastic chassis to the oversized keycaps to the ridiculous dollar bill-sized spacebar slapped into the middle. Not helping matters is the wrist rest, which sticks out maybe an inch and a half (to accommodate the silly spacebar) before ending abruptly. The M800 isn’t quite as large as the original Apex, which had a three-inch nondetachable wrist rest slapped on the bottom. 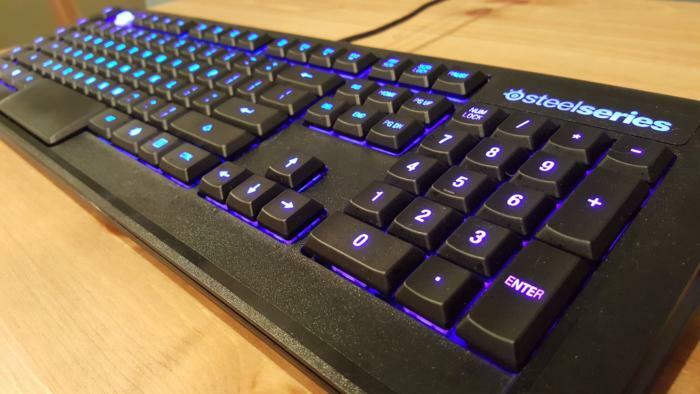 SteelSeries has also made some changes to the key layout—it’s pared off one row of macro keys from both the left side and the top, and combined the formerly independent media keys with the Function row. But still, it’s big. Maybe that appeals to some people. Personally, I find it a bit absurd. I’m hardly at a loss for space on my desk—I’m not in the habit of using a board without a 10-key pad these days, nor do I really need to. The Apex M800 seems oversized for no purpose though. It’s not really more comfortable, nor accessible. Just big. The one aspect I do enjoy: the ultra-tall lettering on each key. If you’re going to make (or buy) an RGB LED-enabled keyboard, you might as well show off that lighting. And the Apex M800 does, with a slim sans-serif that’s easily twice as tall as the ones found on competing Logitech and Razer boards. That means a lot of light shining through. Plug in the board, and it looks beautiful even on default settings—a bright yellow-to-orange gradient runs the length while a set of robin blue macro keys sits on the left end. The board then seamlessly transitions to a cycling spectrum mode when idle. Another nice touch is revealed by tapping the Function key, here represented by the SteelSeries logo. Doing so causes all the lights to turn off except for F5 through F12—the locations of the brightness controls and media keys. 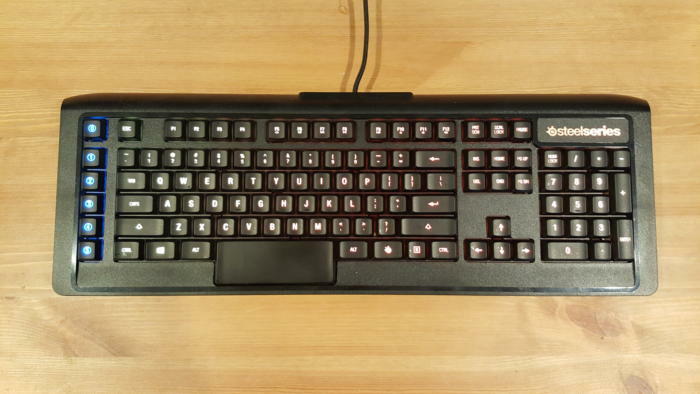 And instead of normal Caps Lock, Num Lock, and Scroll Lock indicators, the Apex M800 opts to simply change the color of those keys when activated. You’ll see the regular colors when off, and white when active. It’s simple but brilliant, and now that I’ve seen it, I wish it were implemented the same way on all RGB keyboards. It’s far more elegant. The on-the-fly brightness buttons provide granular eight-step control, from “Off” to “Blinding,” and lighting is pleasingly constant across entire letters—though the wordier keys (like Enter or Num Lock) do show some signs of dimness toward the outer edges. Powering that lighting is the aforementioned SteelSeries QS1 switch, and it’s the reason you might see dimming towards the edge of keys. Like Logitech’s proprietary Romer-G switch, the QS1 is a mechanical switch with a centered LED. Cherry RGB switches and Razer’s Cherry-alike RGB switches both use an offset LED, by contrast—a restriction of the classic “stem” design. The drawback with the offset LED is you get uneven lighting across keys, or have to compensate for its top-edge placement. 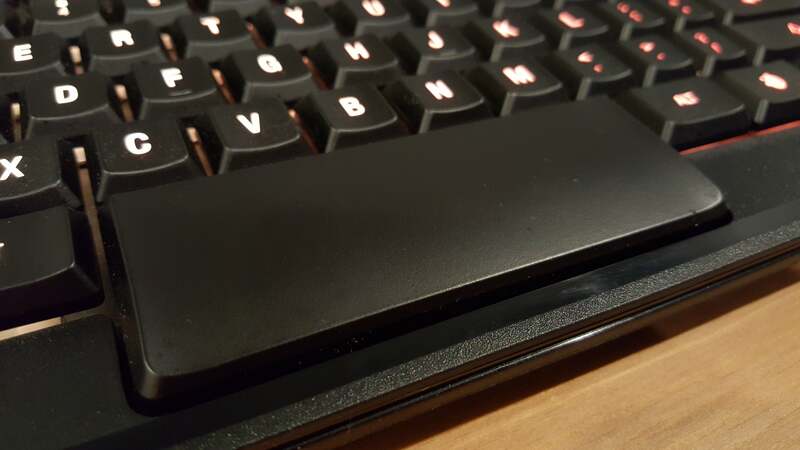 Thus, on Razer and Corsair keyboards you see letters engraved towards the top of each key to take advantage of the lighting, and secondary functions (like media keys on the BlackWidow X) often aren’t lit at all. The QS1 (and Romer-G) have cleaner, more even lighting as a result of the centered LED, but the entire switch has had to be redesigned as a result. The design adopted by SteelSeries is remarkably similar to Logitech’s when you pry off a key—four plastic teeth jutting out from the bottom of each key and into a square switch. But where Logitech’s prongs are thick and long, SteelSeries’s are thinner and shorter. And more fragile, it turns out. Not that you’re likely to often pry a key off the Apex M800, but I did it to take a look at the switch itself. 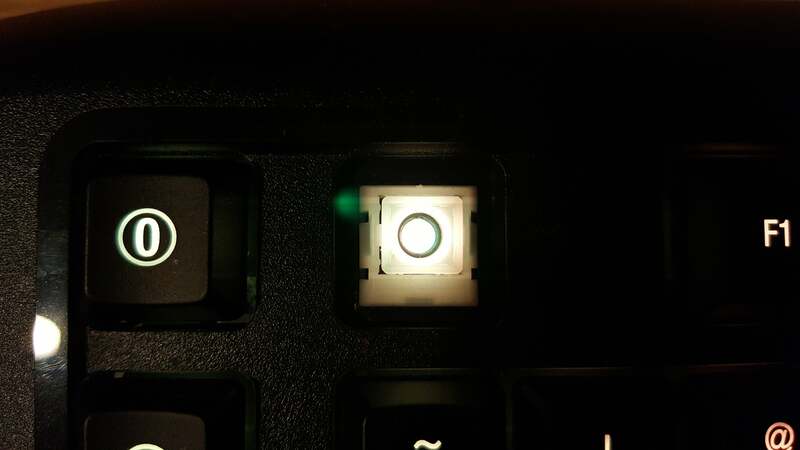 When I removed my usual key (Escape) I cracked off one of its teeth in the process. So, a warning: Don’t do that. Especially because these are custom keycaps, so they’re not easily replaced. If you look closely, you can see that one prong snapped off. The real test of any switch is how it feels, though. If I had to liken it to a Cherry switch, the QS1 is most like the Cherry Red—a linear switch (meaning no tactile “click” as you press) with a relatively low actuation force of 45 cN. The QS1 is a damn good competitor, too. Certainly better than the Romer-G with its odd pseudo-membrane feel. The main difference between the QS1 and Cherry Reds is the travel distance. The QS1 has an extremely slim profile, and thus there’s slightly less distance to cover between pressing a key and it bottoming out/activating. I found it beneficial for gaming—it’s extremely easy to double-tap these keys, even by accident. On the other hand, I found it a bit fatiguing for long periods of typing. My fingers got tired of repeating such short motions hour after hour, the same as when I type on a laptop keyboard. The QS1 holds its own though. If you’re looking for a low-profile switch with the feel of a Cherry Red but more uniform lighting, SteelSeries’ custom solution is surprisingly compelling. If you can get past its biggish bones and that absurd spacebar, the Apex M800 is a solid option for those who want ultra-responsive keyboard switches—especially when it’s on sale. SteelSeries’ asking price of $200 is more than a bit ridiculous, eclipsing even the inflated RGB-enabled board costs from Razer, Corsair, and Logitech. But you can usually find the Apex M800 on sale for around $150, which makes it a better deal. Would I choose the QS1 over a real Cherry switch? Probably not. 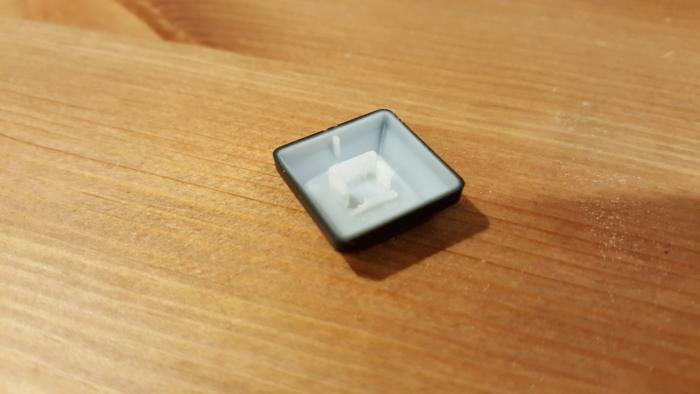 It’s not great for typing, and woe unto anyone who breaks a keycap—you’ll need to go through SteelSeries for a replacement, since they’re proprietary. But in a field littered with also-rans, the QS1 at least offers a worthwhile experience. I’m looking forward to another keyboard with this switch. Maybe one that’s lost a few inches around the waist. SteelSeries joins the "Proprietary RGB Keyboard Switch" fray with the QS1, and—surprise!—it's not half bad.